We’re less than two months away from the release of Disney’s highly anticipated film Frozen. As a result, a lot of merchandise is starting to make its way on the scene. 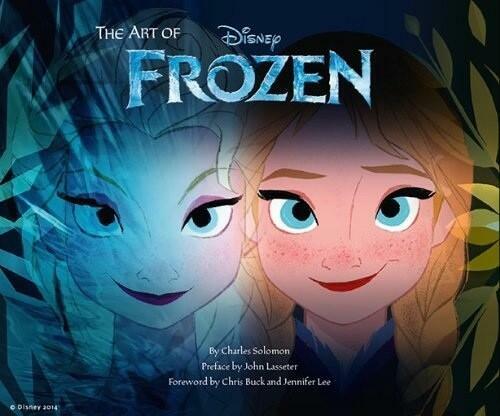 Many of the Frozen books have already been available since October 1, but probably most anticipated piece of merchandise among animation fans is the art book The Art of Frozen. Today, the official cover was finally revealed. The cover shows the two main heroines of the film, princesses Elsa and Anna. Elsa, on the left, is colored in her traditional cool color palette of blues, purples and aquamarines. Anna, on the right, is shown in warmer tones of oranges, yellows and greens. While it’s significantly better than the placeholder cover, it’s definitely a deviation from most Disney’s art book covers. Personally, I’m not a fan of how transparent Elsa is, as if she’s floating away from Anna, but may be symbolic of Elsa fleeing Arendelle after the coronation ceremony. You can definitely see the sisterly resemblance in these front-on shots. It’s interesting that Elsa and Anna are the only character featured on the cover, which goes against Disney’s current marketing of the film. Based on current trailers, Elsa is an ancillary character compared to Olaf the comical snowman. It’s nice that this cover equally shows the sisters together, happy and smiling. In Walt Disney Animation Studios upcoming film, Frozen, the fearless optimist Anna sets off on an epic journey—teaming up with rugged mountain man Kristoff—to find her sister Elsa, whose icy powers have trapped the kingdom of Arendelle in eternal winter. Encountering Everest-like conditions, Anna and Kristoff battle the elements in a race to save the kingdom. The Art of Frozen features concept art from the making of the film—including character studies and sculpts, color scripts, storyboards, and more—alongside interviews with the film’s artists about the making of this comedy-adventure. Based on the amount of concept art (here and here) we’ve seen so far from Disney artists like Brittney Lee, Bill Schwab, David Womersley, Hyun Min Lee, Lisa Keene, and Jin Kim, this book is going to be a visual delight and a treasure trove of knowledge for any Disney fan. The Art of Frozen is written by Charles Solomon, with a preface by John Lasseter and foreword by directors Chris Buck and Jennifer Lee. It will be released on November 19, 2013, one week before Frozen‘s theatrical release. What are your thoughts of The Art of Frozen cover?